Although not perfect in his political views, one has to admire Senator Russell for smelling what much of the world was smelling cooking on LBJ’s & J. Edgar Hoover’s stove at the time: ‘snake oil’. He wanted no part of it. The gangsters LBJ stuck him with on the Warren Commission couldn’t even be honest with the Senator. In retrospect, wouldn’t LBJ & Hoover had been better off rejecting Katzenbach’s ‘we must convince the public Oswald did it alone’ memo & tried a truthful approach? Something along the lines of ‘we really don’t know what happened, but we think Oswald may have been a part of it [but we might be wrong]’. Today’s public is used to drive by attacks in which the perpetrators escape; the 1963 public had seen it portrayed on TV’s ‘The Untouchables’. In retrospect, wouldn’t LBJ & Hoover had been better off rejecting Katzenbach’s ‘we must convince the public Oswald did it alone’ memo & tried a truthful approach? Here are some parts of that memo that conspiracists fail to ever mention. It is important that all of the facts surrounding President Kennedy’s Assassination be made public in a way which will satisfy people in the United States and abroad that all the facts have been told and a statement to this effect be made now. I think this objective may be satisfied by making public as soon as possible a complete and thorough FBI report on Oswald and the assassination. I think, however, that a statement that all the facts will be made public property in an orderly and responsible way should be made now. Conspiracists assume that Katzenbach was calling for a coverup. But Katzenbach didn’t believe any coverup was necessary. In short, you folks are assuming that there was a conspiracy, and that Katzenbach knew that. Two statements you make are wrong, Mr. McAdams. Not all multiple-gunmen researchers believe Katzenbach was calling for a cover-up, because I’m certainly one who doesn’t. Neither am I assuming that Katzenbach thought there was a cover-up, because I don’t believe he did. Lol, I’m sorry but it can be interpreted as implicitly calling for a whitewash or to calm the people. If it was a simple case of a lone assassin, why MUST the government CONVINCE the public of that? Why can’t the facts speak for themselves? If it was a simple case of a lone assassin, why MUST the government CONVINCE the public of that? Because a lot of irresponsible people — or people with an ideological ax to grind — would promote conspiracy theories. I meant to say that I would actually have given LBJ and WC members/staff a pass if they had later admitted that they had concocted the lone gunman theory because they felt it was in the best interests of the country to move ahead and also avoid a possible unnecessary war. There certainly are many who have such animus towards LBJ or the CIA that they cant see through their rage. But that statement would seem to be an overgeneralization and certainly does not apply to many of us serious researchers. Indeed, it seems that many of the supporters of the WC are the ones with an idealogical axe to grind. They often blame the loss of respect in our government’s institutions to the JFK conspiracy theories. Interesting response. “Because…”? Are you agreeing that the WC facts alone were inadequate in the effort to convince the public? The fact is the WC report outlines a weak case owing to inadequate facts. That is what was the most convincing aspect of it from the very beginning. As for the “irresponsible” or “ideological” people, they are here in any event and they are not the target of the WC, the general public was and is. It fails in convincing the general public. Convincing facts would be the best approach every day of the week, unless the facts presented don’t support what the public is being asked to convince themselves of, and they don’t when there are significant facts available that contrast unfavorably with those included in the report. The only responses left for those who are convinced by the report is to “correct” the facts that contrast with it. It’s a full time job. There is a convincing set of facts buried out there somewhere. The question is, what would they convince someone of? Professor, it was only AFTER certain people digested the Warren Commission Report that it’s conclusion became unacceptable. Generally-speaking back then, most people were apathetic towards and had faith in, their government. Even Vincent Bugliosi said that the People began to lose their trust in the government after the Kennedy assassination. Unless Katzenbach had a premonition about rumors and speculation about conspiracy, or was opposed to the fundamental principle of justice (that the accused is innocent until proven guilty), he may have been talking about preempting any suspicion as to conspiracy by instilling into the people, the preconceived notion that Oswald was the lone assassin. That’s an argumentum ad hominem, and I’m sure you are aware that equal ad hominem arguments can be rolled out to attack conspiracy believers. Richard Hofstadter’s “Paranoid Style” is the usual text trotted out. Are you agreeing that the WC facts alone were inadequate in the effort to convince the public? Actually, they would have been if the public had read the Warren Commission Report. But virtually nobody did. They read conspiracy books instead. The fact is the WC report outlines a weak case owing to inadequate facts. That’s the impression anybody would get reading conspiracy books. There are lots of issues where “convincing facts” are on one side, and majority public opinion is on the other. But Katzenbach did want “all the facts” released. Whether “all the facts” will convince people is another issue. That’s the impression* anybody would get reading conspiracy books. At first blush, it’s easy to cast the blame on this group, whom I call the assassination sensationalists, for deceiving the American public. Yet I do not believe they are primarily to blame. Rather, I believe that if there is a dominant reason why the Warren Commission Report has not been accepted by a majority of Americans, it is because all our investigative work was undertaken in secret. Why can’t the facts speak for themselves? … in a WAY which will satisfy people in the United States and abroad that all the facts have been told and a statement to this effect be made NOW. How can he one make this assertion before the investigation or without knowing any of the facts yet? Holland grossly mistreats Cornwell’s analysis of this memo. Cornwell’s case that the ‘machinery of government’ was prematurely set in motion against Oswald does not, as Holland intimates, rest solely on Katzenbach’s memo. It rests instead on multiple lines of evidence Cornwell elucidates, but which Holland ignores, including some sworn statements from Katzenbach. Holland, for example, ignores that Katzenbach nowhere recommended that the backstop Presidential Commission actually investigate the murder, only that it “review and examine the [FBI’s] evidence and announce its conclusions.” Katzenbach made his logic crystal clear during his HSCA testimony, though Holland doesn’t reveal it: “… there is no investigative agency in the world that I believe compares with the FBI then [in 1963] and I suppose it is probably true today.” And, “very simply, if that was the conclusion that the FBI was going to come to, then the public had to be satisfied that was the correct conclusion.” Had Katzenbach already forgotten that in the late 50s J. Edgar Hoover denied the existence of organized crime in the U. S.? Had he also forgotten that by the time he testified to the HSCA, the Church Committee’s expose of widespread Bureau corruptions publicly had demolished the myth of the investigative supremacy of the Bureau? By then, the FBI had disgraced itself in another investigation: after what was called the most exhaustive investigation since the Kennedy assassination, it announced it had proved Nixon innocent of Watergate. Of course Holland is on solid footing arguing that the imperious Hoover would never have prostrated himself before a mere lawful superior, like the Deputy A.G. But the record Holland ignores is that, rather than Hoover obeying his boss, it was his boss who was obeying “diktats” from the subordinate. Was it not, after all, Hoover who announced Oswald’s sole guilt within 24 hours of the assassination, not Katzenbach? And as Michael Kurtz has observed, the day before Katzenbach wrote his memo, Hoover called presidential adviser Walter Jenkins and said, as if anticipating Katzenbach’s memo, “The thing I am concerned about, and so is Mr. Katzenbach, is having something issued so we can convince the public that Oswald is the real assassin.”  Moreover, that Katzenbach got Hoover’s message about Oswald can be gleaned in yet another Walter Jenkins memo Holland leaves out of the discussion. On 11/24/63, Jenkins relayed to LBJ the story that one Homer Thornberry of the Justice Department had “talked with Nick Katzenbach and he is very concerned that everyone know that Oswald was guilty of the President’s assassination.” Thus, if Holland is right that his memo of 11/25 inartfully conveys Katzenbach’s early openness on the identity of the culprit, it is a remarkable coincidence that Katzenbach was just as inartful in conveying that openness to a subordinate the day before. I looked on John McAdams’ site, but couldn’t find anything about Senator Russell’s role in the Warren Commission and of his problem in supporting the single bullet theory. Does McAdams cover this topic on his site? Anyone know? Thanks. That was bizarre but fun to read. Is there a recording of this infamous conversation between LBJ and Warren? It’s just amazing to me! Here’s a highly respected, indoubidibly credible member of the United States Senate expressing reasoned doubt, and it’s completely drowned out by his fellow men of great character. Hale Boggs didn’t agree with the WC’s conclusions either. He was the person who got Jim Garrison to start looking into the assassination. Great character…? Most of them had a dog in the fight….Some much more than others. CIA files from 1963? – Is anyone interested in NSA files from ’63? “I asked Ed who he thought was behind the assassination, and he said “the CIA”. Senator Russell, in spite of his racism, should be honored for trying to speak the truth about the assassination as the first official, elected dissenter. A large part of the American People were the True first dissenters before the report was ever written. The afternoon and evening of 11/22/63 they gathered around black and white TV’s or radios or read newspaper extras about initial reports of shots from the front, the knoll, the railroad yard. Some saw Presidential assistant press secretary Malcolm Kidluff point to his right temple. Some heard dallas Parkland ER Dr. Malcolm Perry speak about an entry wound in the throat. Two day’s later they watched a mob hit on the accused assassin who claimed he didn’t shoot anybody and was a patsy on live TV from the dallas jail. Why do we question the official version reached in two days with a squelched investigation? If I recall correctly, wasn’t it LBJ who said Warren was either in tears or on the verge of tears when he left his office. That meeting was essentially the beginning of the WC cover up. Russell, in my opinion, was probably not just the first dissenter. He was probably the best of the WC appointees. He boycotted most of the meetings, wrote a letter of resignation–which he did not mail-and when he saw what the WC was going to be, he conducted his own inquiry. Make no mistake, the majority, that is Dulles, Ford, McCloy and Rankin knew what was up with this guy. That is why they tricked him at the last meeting. They used a stand in to pose as a stenographer, when in fact she really was not. Russell headed what I call the Southern Wing of the Commission, with Boggs, and Cooper. They were the first to break away from the whole mess. Second- McAdams reveals what is at the heart of his defense of the WC: “Because a lot of irresponsible people — or people with an ideological ax to grind — would promote conspiracy theories.” Indeed, it seems that the supporters of the WC are the ones with an idealogical zxe to grind. They often blame the loss of respect in our government’s institutions to the JFK conspiracy theories. I would actually have given LBJ and WC memebers/staff if they had later admitted that they had concocted the lone gunman theory because they felt it was in the best interests of the country to move ahead and also avoid a possible unnecessary war. that our nation is no really no different than other countries and that our leaders would resort to expedient measures (i.e., lies, coverups) to preserve power. I believe that “if you like your health care plan, you can keep your health care plan” was a lie (so does the Washington Post). I believe there is a cover-up of IRS harassment of Tea Party groups. But I like it, and I like it, I like it, how about you? Again, you demonstrate that your motivation for everything you say on this topic is political. It’s pretty clear that politics trumps logic in your arguments. So it’s OK to say that government lies and covers things up, until somebody says that the Obama Administration did that. John, I have no idea what that means. I don’t make political points on this site, and I don’t think partisan politics was a factor in the assassination. But the point is that you keep bringing politics into your posts. The idea being that a conspiracy is a “liberal” view and lone gunman is “conservative.” Your side is conservative, so you have to fight every liberal point as if this is Crossfire. That you inject ideology into a murder investigation is a serious blow to your credibility. It’s not debatable. Paulf, it is refreshing and reassuring to read that some who follow this site recognize this remains a cold case murder investigation, not an intellectual let alone political exercise in determining how the history of the assassination of President Kennedy is recorded. The idea that we can vote to resolve the investigation is disturbing; consensus rather than conflict serves democracy in the House and the Senate, but the method should not be applied to resolution of this murder case. Actually, I was testing you conspiracists to see whether you were political. It turns out you were. Schnapf was loudly proclaiming that we lone assassination people don’t believe the government ever lies or covers up wrongdoing. I said that I know it does, but I used Obama examples to see how you folks would react. It turns out you don’t much like hearing that Obama would do those things. So why don’t you like hearing such stuff about the Obama Administration? Would you object to hearing it about the Bush Administration? Let me assure the “professor” that I think that Obama is no less a creature of the financial elite than any other politician in DC. The entire government is titular, taking it’s orders from The Power Elite, as C. Wright Mills named the group the Founders simply called “the Money Power”. Sophisticated political scientists grasp that the Right/Left Paradigm is a hoax generated by the Hegelian Dialectic. Naive political scientist fight for one side or the other. For a so-called professor, you are remarkably dense. Russell told LBJ that he did not believe in the SBT and LBJ replied that he did not believe it either. The phone conversation with LBJ and Richard Russell is solid evidence people at the very heart of the Warren Commission didn’t believe it’s conclusions. By saying they didn’t buy the single bullet theory is tantamount to saying there is more than one shooter and thus a conspiracy. In not investigating or delving into this aspect of the investigation reveals the true purpose of the commission. LBJ also repeated this belief on a CBS interview that was requested to be edited due to “National Security Concerns”. Where have we heard that before? Much more interesting, and if anyone has any information. is that Richard Russell was doing his own investigating behind the scenes. In the 50 reasons for 50 years videos it says he found that from sources that Oswalds id was being used by 2 people as part of the false defector program. NOw that is quite interesting. Rankin’s scam on Russell with the fake stenographers during Russell’s dissent session is proof enough that the whole Warren Report was a scam. Something I think many of us have figured out during all of these years of research. Rankin just pulled on Russell what the WR was about to pull on the rest of the American people – shameless fraud. Willy, I thought it was Dulles who orchestrated the Russell dissent debacle. I’ve looked a little in a couple of books but didn’t find anything either way. To expound on the story from memory for those not familiar… Senator Russell refused to sign the Warren Report without issuing a dissent, to appear in it. I thought it was Dulles who said words to the effect of “we can accommodate this”. He, Rankin or whoever then set up a room for the stenographer to record Russell’s dissent. But the stenographer was not a stenographer. Russell’s Dissent was never recorded, purposefully. Thus it never appeared in the Warren Commission’s Report. I did find these references to Russell. “1966… he disagreed with the Single Bullet Theory.” The Atlanta Journal. Reclaiming Parkland, Jim DiEugenio, pgs. 259/259. As I recall, Rankin, Dulles and Warren himself were all in on the ruse on Senator Russell. I also recall that Hale Boggs wanted to include a similar dissenting view as per the single bullet theory. The citizen investigation of this has uncovered sufficient evidence to prove the “single bullet theory’ to be a lie. The pages of this very blog, JFKfacts is filled with facts and data proving this. Yes, the Warren Report was meant as a grimoire, a book of magic spells to put the people of the US in trance. It has not and will not succeed in this goal. There are too many of us pressing forward with uncovering the truth. What is the source for this “fake stenographers” story, gentlemen? Chapter 11 of McKnight’s fine book “Breach of Trust” is titled Senator Russell Dissents, and discusses the September 18, 1964 Warren Commission Executive Session in detail, working from information developed by Harold Weisberg in the late 1960s.The “fake stenographer” is derived from the fact that a) the stenography firm which handled all the Commission’s transcripts, Ward and Paul, was not at hand for this meeting (their billings are in the record and their last account was on September 15); and b) there is no transcript of the September 18 session, just a minute based summary which only obliquely referred to Russell’s critique of the SBT (and was not distributed until November that year). The entire point of the Sept 18 Executive Session was to get Russell’s dissension on the SBT in the record – which did not happen. Russell, understandably, felt tricked. The person taking notes for these minutes was presumably the person some writers have called a “fake” stenographer. But stenographers write up minutes, too. Instead of calling in the company used in the past, someone’s secretary might’ve been brought in at the last minute to take shorthand notes. There’s no evidence either of those two things happened, so both are speculation. That’s all I’m saying. Russell left the meeting, got on a plane and was in Georgia when LBJ called that evening. That’s aside from Connally’s own testimony specifically contesting that “assumption”. The REAL issue is not one of a “fake stenographer” is it…? This is what upset Russell years later when Weinberg showed him the minutes – his specific dissent, the purpose of the meeting, had in effect been removed (not recorded). That this meeting’s agenda was largely concerned with Russell’s dissent is confirmed by the fact that LBJ felt it necessary to follow up on it via a phone call later that night when Russell had returned to Georgia. The transcript of that call shows discussion over the SBT (not the number of bound copies or whether the printing should be in gold leaf). (FWIW, in my opinion LBJ, through this call, is less expressing his opinion on the SBT -i.e. “I don’t believe it either” – and more trying to mollify Russell. I’m not sure LBJ followed closely the details of the Commission’s Report, or even processed the mechanics of the SBT). While it is possible that “someone’s secretary” might have been brought in to take minutes instead of Ward and Paul, what is not possible is that the extant minutes accurately reflect what occurred at the Session – a Session where, according to Russell, he had announced that he was not going to sign off on the Commission’s Report. There is no addendum with Russell’s dissenting view in the WC Report. Doesn’t that settle this matter? Less touted but perhaps more significant is WC member John McCloy’s evident skepticism, at least with the phrasing in the draft report related to the SBT. This bought McCloy some points until one considers his apparent failure to stand with Russell, Cooper and Boggs in the end. McCloy was a seasoned hunter so he would have known precisely what was at issue with the stretcher bullet. Was he placing on the record what was little more than a superficial challenge, a posturing for posterity? And why wouldn’t his hesitation as a senior member of the commission – a highly respected former Asst. Sec. of War and corporate lawyer – have been enough for Dulles and Warren to question the SBT? Perhaps someone more familiar with McCloy could enlighten us? A Warren Commission member expressed serious reservations about one of the panel’s more controversial conclusions, the theory that a single shot wounded both President John F. Kennedy and Texas Gov. John Connally, a long-secret document has revealed. The “magic-bullet” theory was essential to the commission’s conclusion that Lee Harvey Oswald was a lone assassin. Marked “confidential,” the released document was a memorandum sent by commission member John J. McCloy to the commission’s chief counsel, J. Lee Rankin. It was dated June 24, 1964, seven months after Kennedy’s assassination in Dallas, and conveyed McCloy’s critique of a draft of the final Warren Commission report. I believe many LNers consider that an non-consequential question but here’s McCloy asking the same thing. And we still don’t have a real answer. Connally told the HSCA that he didn’t know which shot hit JFK because he couldn’t turn far enough to see him before he (Connally) was wounded, and the Z film shows that this is true. His wife thought the two men were hit separately. I don’t know what he said to Weisberg about the minutes of the meeting and can’t find it online. Jean, do you have any comment related to John McCloy’s letter to Rankin regarding his reservations about the SBT? Where Jean? Is it in the Warren Report itself, or one of the other volumes? Can you supply the Vol No. & Page No. please? I just quoted it, Willy. Page 19, Warren Report. That’s it? Russell was satisfied with that? What happened to all the testimony he gave that was never taken down? Why did Russell continue to complain after the report was published? Because the commission screwed him with that “little old thread”, as he characterized it. The Warren Commission was dishonest with Russell and the American people Jean. This little incident is only a small part of a larger mosaic. Jean – you seem to excel at literal readings of documents written by lawyers. So that you present the Conclusions of the Warren Report as some sort of good-faith effort to accurately represent the opinions and activity of the Commission is therefore not surprising. But there’s a reason why a defence of the SBT has been central to defenders of the Commission since it was published: because without the SBT any proposition of a single shooter becomes null. So while the vague language on page 19 may convince you of a suitable appearance of dissent (or “difference of opinion”) against what is otherwise described as a “probability”, it is clear that the centrality of the SBT to the Commission’s conclusions – “the shots were fired…by Lee Harvey Oswald” is vastly downplayed here. McKnight’s book presents the thesis that the Warren Commission was very much a bad faith enterprise, determined to cover-up the true facts of the assassination. Evidence of this bad faith is obvious directly within the paragraph you present as representing the Commission’s good faith, as it is claimed “there is very persuasive evidence from the experts” supporting the SBT. Who are these experts? They are Oliver and Dzieman, from the Biophysics Division of Edgewood Arsenal, a veterinarian and a PhD physiologist respectively, brought forward after the senior expert Joseph Dolce, chairman of the US Army’s Wound Ballistic Board, said the evidence could not support a SBT. All Bethesda and Parkland doctors concurred with Dolce. Out of eight “experts”, six told the Commission the SBT was a non-starter. The two men the Commission then relied on were the least qualified of the group. Jean knows all of this full well Jeff. This was discussed at great length through several thread last year. Joseph Dolce was by far the most qualified ballistic expert available to the commission. As is most often the case the most qualified experts disagreed with the commissions “findings” in almost every area of their so-called “investigation”. But the Warren Commission’s whitewash and cover up does not stand to scrutiny, and as Norman Mailer once remarked, can be likened to “a dead whale decomposing on a beach”. I appreciate your civility in discussing these issues. My main argument is that people shouldn’t rely on secondary sources. It’s a “given” in some parts of the CT community that Dolce was the expert and Olivier & Dziemian were unqualified in wound ballistics. I don’t know where that started, but I believe the opposite is true. Did Dolce have any wound ballistics papers published? None that I can find. He was a Florida surgeon and retired Army colonel who was Edgewood’s “chief surgical consultant” according to his obit. What’s the evidence that the other two men were called in after he objected to the SBT? Does anybody here like Dolce’s 3-shot scenario on that page? The doctors who were skeptical about the SBT weren’t ballistics experts. But actual ballistics experts have endorsed the SBT and it has been demonstrated by Martin Fackler and others. Martin Fackler did not replicate the conditions under which CE399 is asserted to have went through. Which were to have hit Kennedy in the back, punctured and gone through the material of his coat, and shirt, then through the dermis muscle and other tissues as it transited through his body and then punched through the dermis of JFK’s throat. Then this bullet is claimed to have hit Connally in the area of the right armpit at an oblique angle; going through the material of a suit coat and shirt, the dermis, fatty tissues and muscle of the governor’s armpit, then the pectoral muscles, scooting across a rib shattering a portion, then exiting through another layer of dermis and suit material, and THEN hitting the governor’s wrist and shattering it–a portion of said bullet then lodging in the governor’s thigh. That is quite a bit of work for one bullet, a lot of physical stresses put on the materials it is made of. Fackler didn’t even attempt a reproduction of these conditions. He merely calculated the distance and loss of speed of the proposed bullet while doing this work, and calculated how much power the missile would loose during these encounters. Coming to a seemingly reasonable speed at which the bullet would have been traveling at the time it hit the wrist, Fackler simply reduced the powder charge in the load in the cartridges he used for his experiments, then fired these lightly loaded bullets at cadaver wrists to find what deformation the missiles would have. The position of Kennedy’s back wound at T-3. The fact that the throat wound was one of entry. The broken chain of custody for the Parkland Bullet. The evidence in the Zapruder film that JFK was hit in the throat many moments before Gov Connally was hit. As Fackler’s bullets only endured the encounter with the wrist, it is unreasonable to claim that the damage he came up with is comparable to a bullet said to have done so much more work; CE399. Jean – your position, as well as the opinions of the “ballistics experts” who endorse the SBT, will always be in the minority – as the Warren Commission discovered. Olivier appeared alongside Dolce and Frederick Light, also from Edgewood, at a Warren Commission conference held April 21, 1964. Dolce and Light joined the medical personnel in rejecting CE399 as the source of the wounds in Connally, based on its intact qualities. Olivier withheld judgment until he conducted tests. These tests were done after this conference, after it was apparent – through the course of Specter’s questioning – where the Commission would like this to go. Olivier could not produce visual evidence of his eventual claim that CE399 could retain its form after smashing dense bone. 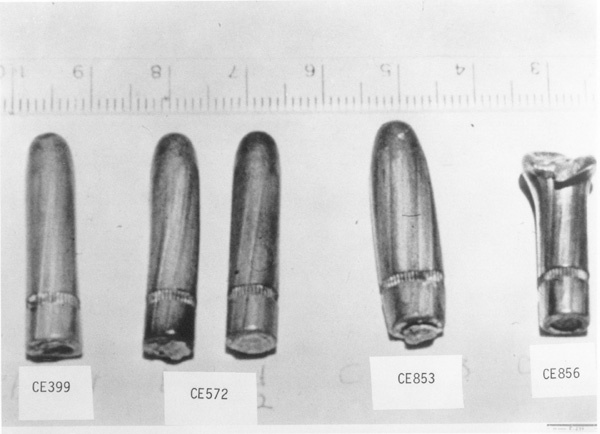 The bullet photographed from his tests published by the Warren Commission (CE856), was clearly damaged far more extensively than the magic bullet, even as it was later revealed to be the least damaged photographed bullet from his tests. Howard Roffman discussed these issues in his book Presumed Guilty (1976). Roffman highlights the testimony of the FBI’s Frazier (3H430), regarding the microscopic markings on CE399 – the lands and grooves – which remain “continuous and without disruption” along the length of the bullet, a virtual impossibility if the bullet had actually done what was claimed. Of course, this is all academic as the position of the wound entry on Kennedy’s back is too low for the SBT to work in the first place. Willy & Jeff, did you know you’re disagreeing with Dolce about the location of the back wound? Dolce didn’t explain how he thought the bullet that went through JFK’s “neck” failed to hit Connally yet somehow ended up on a stretcher at Parkland or how “one fragment” could hit both C’s thigh and the windshield. Any ideas? So what? Dolce did not see JFK’s body and merely relied on the Warren Report. I don’t buy anyone wholesale Jean. I buy what makes reasonable sense according to their expertise and knowledge, I reject what is not reasonable as per known facts. 4. — The likelihood of a duck response to a nearby dangerous event. 10. — Particular circumstances of specific witnesses, that could effect the reliability of a certain witness (Handicaps, etc). Jean – Dolce’s speculations are, frankly, irrelevant to the discussion at hand. What is being examined here is how the Commission dealt with Richard Russell’s dissent on the SBT. We have seen that the Warren Report invoked “experts” to claim “persuasive evidence” backing the SBT and CE399’s centrality to the theory. But we have also seen how, in April 1964, during two important conferences discussing these issues, all but one of these experts actually refuted the theory, or that it could be possible for CE399 to be responsible for all the damage. (one expert withheld opinion). “Dr. Olivier’s tests, despite their shortcomings, demonstrated a very common ballistics principle — that a bullet striking bone will usually suffer some form of distortion. “Memorandum for the Record,” dated April 22, 1964, written by Melvin Eisenberg about a conference held on April 21, 1964. He’s your wound ballistics “expert,” Willy. And you’re rejecting his reconstruction of the shooting. Having attended numerous meetings in which secretaries prepare “minutes of the meeting,” and having testified as a medical expert in trials and depositions, there’s a world of difference between “minutes,” which are summaries, and stenography, which is supposed to be verbatim. That there can be a world of difference is reflected in the fact that, as often happens at, say, board meetings, members amend the minutes of prior meetings because of errors or omissions. What should have been done, but wasn’t, was to have a proper stenographer “recording” the exact words of that last meeting, as had been the case with all the other meetings. Dolce is not “my” anything Jean. I am not relying on Dolce’s opinions or “his reconstruction of the shooting.” I am relying on his ballistics findings as per the impossibility of C399 remaining in near pristine condition after all the work is supposedly accomplished. I gave you my shooting scenario because Dolce’s does not make reasonable sense considering the information he was not aware of as per the actual back wound location at T3, the fact that the throat wound was one of entrance, and the impossibility of C399 hitting JFK in the back at the angle proposed from the TBDB. Dolce was also unaware of the fact that the chain of custody for the Parkland Bullet was not linked to CE399. Dolce was unaware of the trajectory analysis by CSI Fiester, nor of the problems with the extant autopsy X-rays. So Leslie, if Mc,Cloy doubted the conclusions of the Warren Omission along with Russell, Boggs, and Cooper that’s 4 of 7 WC members. A consensus. With Warren possibly drug by the neck by Dulles, LBJ and Hoover (you pick the order). Part fact, part reasonable speculation? if there is such a thing. The fact that CE399 shows the lands and grooves of the Carcano identified as the murder weapon, this leads to another branch of inquiry. This is because weapon’s expert Frazier testified that the Carcano he inspected and identified as the murder weapon to him on 11/23/1963, had NOT BEEN FIRED RECENTLY. The conundrum arises, since the FBI lab had the weapon that had not been fired, someone had to fire the weapon to produce CE399. It is an inescapable conclusion that the FBI fired CE399 in ballistic gelatin, and then planted that bullet in evidence. The fact that CE399 shows the lands and grooves of the Carcano identified as the murder weapon, this leads to another branch of inquiry. This is because weapon’s expert Frazier testified that the Carcano he inspected and identified as the murder weapon to him on 11/23/1963, had NOT BEEN FIRED RECENTLY [*] The conundrum arises, since the FBI lab had the weapon that had not been fired, someone had to fire the weapon to produce CE399. It is an inescapable conclusion that the FBI fired CE399 in ballistic gelatin, and planted that bullet in evidence. [*] Mr. Eisenberg. So that it is impossible to attribute any given amount of wear to the last user? Mr. Frazier. Yes, sir; it is impossible. Mr. McCloy. How soon after the assassination did you examine this rifle? Mr. Frazier. We received the rifle the following morning. Mr. McCloy. When you examined the rifle the first time, you said that it showed signs of some corrosion and wear? Mr. McCloy. Was it what you would call pitted, were the lands in good shape? Mr. Frazier. No, sir; the lands and the grooves were worn, the corners were worn, and the interior of the surface was roughened from corrosion or wear. Mr. McCloy. Was there metal fouling in the barrel? Mr. Frazier. I did not examine it for that. Mr. McCloy. Could you say roughly how many rounds you think had been fired since it left the factory, with the condition of the barrel as you found it? Mr. Frazier. No, sir; I could not, because the number of rounds is not an indication of the condition of the barrel, since if a barrel is allowed to rust, one round will remove that rust and wear the barrel to the same extent as 10 or 15 or 50 rounds just fired through a clean barrel. Thank you Brad Polhemus, for your god-like perceptions, prescience and certainty. Too bad pain relief for attention to details isn’t in your job description! Better luck next universe. My suggestion to you is to pick on someone your own size. Have a nice day and thank God for what you have! the name of another commenter, especially another commenter’s real name. Sorry I ever responded to Brad as a distraction. Russell was a Bigot and Racist but by also the somewhat unseemly term a Truth Seeker in the JFK Assassination. Agreed. I was being a smarta$$. Sorry – Willy Whitten. Your comment was a little snide – so I responded in a like manner. I apologize. There are many who have thousands of hours into this subject – and I would be included among them – just as many here. I do know that the essence of the event is that the U.S. government was corrupt then. Now????? To the other historians out there… please read Roger Stone’s book – “WANTED”. His new book (coming soon) will outline the Clinton’s horrific rise to power. The JFK assassination and the cover up escaping over the last 20 years is tied to Luke 8:17 in the bible – if you care to know or research. Remember… Roger Stone worked for Nixon as a young man and call tell you after 35+ years in Washington… how corrupt it really is. Your certainty is again greatly mistaken. I do not buy any of those spurious theories. Before assessing those who have spent a great deal of time on this forum, you should take the time to review what each of us has said in previous threads. And no, I do not now, nor have I ever owned a chocolate factory. Ronnie, if I approve your comment, you will be encouraged to continue adding “filler” to your comments. Either you have something to present that is more than clutter, or you don’t. You posted a link, you had the option to describe, even if only in one sentence, what could be found at that link, and why you think it is relevant. The overall appearance of discussion threads will not include comments presenting links with no descriptions or comments of fewer than five words. Tom, in the link you refused post because of the number “three” I was trying to alert readers to a source of information about a new poster with questionable information. The eye tracking and Military links are what caught my eye. I’ve not done a genealogical search. I don’t think any Warren Commission member believed the report they issued which is pretty hilarious lol. This brings you right to LHO and DRE where we learn Joanides is the case officer for DRE, then we learn Joanides was brought out of retirement when Hardaway and Lopez were digging into these relationships and lied about it to congressional investigators (committing a crime in the process that Blakely later in life agreed with). Then we later had a visual confirmation of Phillips (Bishsop) meeting with LHO in Dallas. Man LHO was meeting with serious intelligence/military men. Without getting into the who killed JFK saga, the Warren Report in its description of LHO as a lone nut is entirely False, I think almost everyone can agree with this. The CIA ties with LHO are fascinating IMO and this relationship continues to grow as more documents are released (The AARB was possibly the most important foreign policy and intelligence operations History lesson ever provided to us, the data is factual and just incredible). Speaking strictly from a investigative perspective, Garrison was at least on the right track in terms of LHO use by intelligence agencies (I doubt LHO was aware of how deep he was into serious national security matters). I tip my hat to the guy as he had an impossible job. I think CIA documents on Garrison will be very interesting. Not to mention that the two real prosecutors who were heading down the same evidence trail of Garrison in the early stages of HSCA both maintain to this day that the CIA stonewalled them then engineered their removals. And the mainstream media still remain silent on that. I think at this point while many disagree about whether LHO acted alone , it has been pretty much confirmed via AARB documents and new evidence that LHO was no lone nut but rather right in the middle of the USA vs Cuba intelligence wars . I would be curious to see what the Warren report supporters feel about LHO after the AARB documents . Do they support the WC lone nut conclusion about LHO or do they believe LHO was deep in the Castro intelligence wars ? I don’t want to get into a discussion about who killed JFK as that is a waste of time and counter productive but rather their thoughts about his connections to intelligence operatives and operations. I agree on the Main stream media . How their wasn’t significant reporting about the CIA misleading the WC and admitting to obstruction of justice in the biggest crime of our nation IMO tells you the CIA still has a lot of media support . The media spends days and days over Clinton email mess and hardly even mention that a govt agency lied to the people , over a matter that’s had huge implications on our foreign policy that impacted nearly everyone. Btw to me it’s interesting the CIA even made the obstruction of justice admission and leads me to think there will be some interesting 2017 documents , why else would they admit to an act that was so despicable. Deceit over covert ops is one thing but you can’t mislead the public in the investigation of the murder of our president . I’m also curious what some of the Warren Report supporters feel about the CIA admission ? Do they still believe the LHO narrative – not whether he killed JFK – but rather do you still have faith that the WR was accurate and transparent ? Yes, it’s amazing all this is still up in the air 53 years later. Vacationing in DC and took my family to Kennedy family gravesite (as it’s noted in the Arlington guide). Thought the tram “historians” did their best to push everyone past JFK’s grave and onto Tomb and other points of interest. We were the only ones to get off the tram at JFK’s site. Thank God he did. We now know the Russians had battlefield nuclear weapons and the invasion would’ve likely gone nuclear very quickly, escalating to a possible full exchange. JFK was the coolest cat we could’ve possible had teh at the helm at the time. After the Cuban Missile Crisis, JFK then did something even more remarkable. He sued for peace and an end to the Cold War. All this is still not well-understood or appreciated by the citizenry today. JFK talked tough to serve the politics, but just like Lincoln and ending slavery, he knew where he was headed. And it was to bring peace to the world.